The Mountain Gorilla is the largest primate in the world. A male Mountain Gorilla can reach up 1.9 metre (6.2 feet) in height. Its arm span is about 2.3 metre (7.5 feet) and it weighs about 220 kilograms (485 lb). 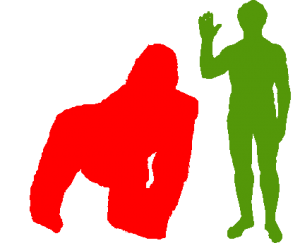 An adult male Mountain Gorilla is twice as large as the female Mountain Gorilla. A female Mountain Gorilla is about 98 kilogram (216 lb) and it is 1.5 metre (5 feet) tall. Their arms are longer than their legs. The Mountain Gorilla is one of the 2 subspecies of the Eastern Gorilla. There are 2 populations. One is found in the Virunga volcanic mountains of Central Africa. The other is found in Uganda’s Bwindi Impenetrable National Park. In 2010, there are about 790 Mountain Gorillas in the world. They are critically endangered. Mountain Gorillas have longer and thicker fur than other gorillas because they live at high altitudes (2500-4000m, or 8200-13000 feet) in cloud and bamboo forests where the average temperature is between 8C to 20C (45-70F). Each Mountain Gorillas’ nose prints are unique. Adult males have more pronounced bony crests on the top and backs of their skulls. This gives their heads a conical shape. Adult females also have these crests, but they are not so obvious. They have longer jaws and teeth too. The adult males grow a patch of silver hair on their back and hips. That is why the adult males are also called Silverbacks. Their eyes and ears look small compared to their big head and hairless, shiny black nose. The Mountain Gorilla lives mainly on the land. He tends to walk on all 4 limbs at certain times. They will only climb on fruit trees which can stand their massive weight. It is able to run on its 2 back limbs for short distances. They are active in the day time. They spend most of their time eating. They do need lots of food to maintain their huge body. They look for food early in the morning and then rest during the late morning and around midday. In the afternoon, they will search for food again before resting at night. Each Mountain Gorillas builds a nest from leaves and plants around them. They will sleep in their nest. Mothers usually share their nests with nursing babies. They will leave their nest when sun rises at about 6am except when the weather is gloomy and cold. 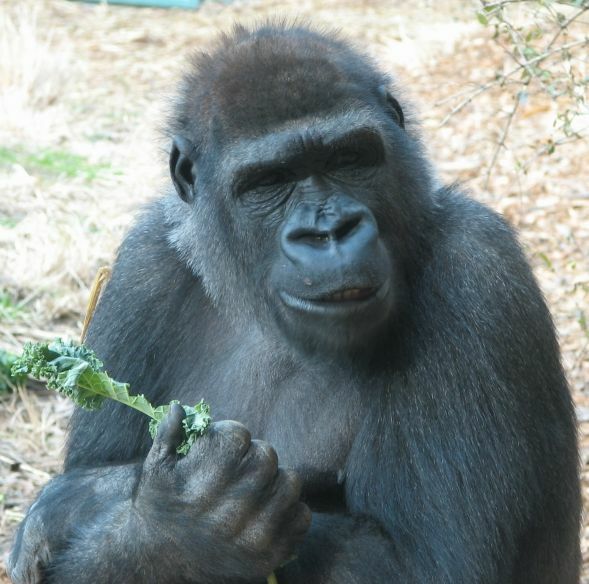 The Mountain Gorilla is mainly a plant eater. Their main diet is leaves, shoots and stems. Apart from that, it also eats bark, roots, flowers, fruits and small invertebrates. Adult males can eat up to 35 kilograms (75 lb) of plants a day. However, a female will only eat about 18 kilograms (40 lb) a day. A newborn Mountain Gorilla weighs about 1.8 kilograms (4 lb) and spends its first few months of life under its mother’s care. The mother will carry it on her back. At first, the mother will constantly be holding the infant. It begins to walk at around four or five months. It will start to eat plant parts between 4 to 6 months. At 8 months it regularly eats solid food. The mother will stop giving her baby milk when it is around 3 years old, but the young Mountain Gorilla will still remain close to her or his mother. Mother Mountain Gorillas only give birth to one baby every 6 to 8 years. Most male Mountain Gorillas and about 3 in every 5 females leave their parents’ group. Males leave when they are about 11 years old. The process of separation is slow. They will spend more and more time on the edge of the group and finally they will leave the group for good. The Mountain Gorilla lives in groups of about 6 to 12. They will normally have the oldest and the largest male silverback leading a family of 3 females and 4 or 5 offspring. The silverback leads the group to good feeding sites throughout the year. He will also try to resolve conflicts within the group and protects them from predators. The leader is the centre of attention during their time of relaxation and young Mountain Gorillas will often stay close to him and invite him to play along them. If a mother Mountain Gorilla dies or abandons the group, the silverback will usually take care of the abandoned offspring, It will even place them in its nest. An experienced silverback is capable of removing poachers’s wire or cord from the hands or feet of its group members. When the silverback dies or is killed by disease, accident or poachers, the family group may be seriously split if he did not leave behind a male descendant who is able to take over his role. The Mountain Gorilla establishes and strengthens their relationships within the group during their time of resting in the midday. The females will groom their offspring regularly, making sure their hair has no dirt or fleas. They learn how to communicate and behave within the group through play. The silverback and the adult females may even participate. There are at least 25 distinct kinds of sounds the Mountain Gorillas make. They are used while communicating in the thick forest. Sounds classified as grunts and barks are heard most often while travelling. Thes sounds indicate the whereabouts of individual group members. Screams and roars signal alarm or warning are normally produced by the silverbacks. Deep, rumbling burping sounds indicate that the mountain gorillas are contented and it is frequently heard during feeding and resting time. 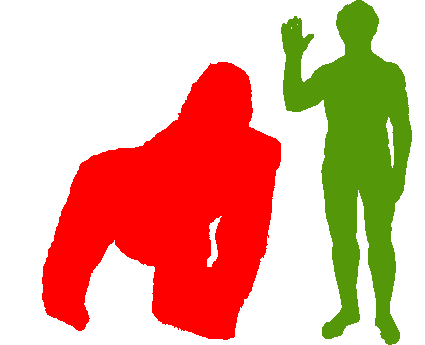 For some unknown reason Mountain Gorillas are afraid of certain cold blooded animals. For example, baby Mountain Gorillas are afraid of chameleons and caterpillars. They are also afraid of water. They will cross a stream only if they have a log to step on so they don’t get wet. Mountain Gorillas are threatened by illegal hunting, war, disease, deforestation and illegal pet trade. They are frequently killed by traps intended for other animals, They are hunted for their heads, hands and feet. The body parts are sold to the collectors. Baby Mountain Gorillas are sold to zoos, researchers and pet stores. When a baby Mountain Gorilla is taken away, generally at least one adult in the group will end up dying because it will fight to death trying to stop the baby from being taken away. All these activities have caused a drop in the population of Mountain Gorillas. Conservation efforts have started to save these seriously endangered creatures. Hello my name is Tristen and I am doing a research report on Mountain Gorillas. The scientific name for them is Gorilla Beringei. I was wandering if you could send me any info on them. I really need the gestation period, their daily temperature, their living space required, their dailey water requirements, vegitation, climate, how much it is worth in illegal trade, the problems it is creatin for humans and how they are creating those problems, how you are protecting the moe mountain gorilla, how much you are spending to save them,and what is being done to help them. Also, if you could send me any brocers, pamphlets, etc. that would really be appriciated. thank you for your time and help. We aren’t experts on Mountain Gorillas specifically. You’ll find a lot of general information from encyclopedias. You could start with Wikipedia, but don’t forget to follow the references given in the wikipedia article – some schools don’t accept wikipedia as a valid source – you should check with your instructor. Don’t neglect Encyclopedia Brittanica, of course.